Welcome to our 10th Delicious Doodles challenge. Thank you for all your entries last week, so fabulous! This week sees Remembrance Sunday here in the UK.... and the US are just about to have Veterans day.... So in memory of all those who have died in action, also for everyone who has someone to remember, whatever the reason, our theme this week is 'Remembering'. I have made a small shrine using one of Teri's lovely poppy images. I printed the image out 7 times, coloured it with promarkers.... fussy cut and decoupaged it up. I used die-cuts around the shrine and to decorate the fake tea light..... the shrine is covered with DP that i heavily distressed with paint. I have a few precious loved ones i like to remember..... and on Sunday i shall remember all those who lost their lives during wars and conflict. 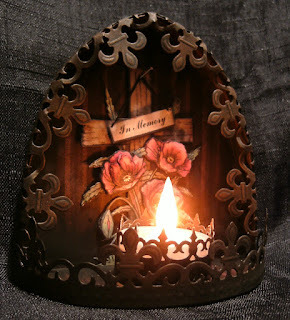 I hope you'll join us this week, we look forward to seeing your remembrance projects. WOW !! what a fabulous creation, the details are absolutely gorgeous :-) A lot of thought went into this and it was well worth all the effort ! so so beautiful and such pretty detail work! BEAUTIFUL LOVE LOVE LOVE, I saw your bright light on Make it Monday and had to take a closer look. Your work is beautiful. Very nice way to honor those to gave. This is stunning !! What a meaningful keep sake !! Thanks so much in sharing it with us at Crafty Sentiments this week !! Wow! Absolutely gorgeous and obviously very heartfelt! Thank you for sharing it with us on the Sparkle and Glitter challenge. WOW this is absolutely amazing... again I am having to lift my jaw up from the floor. True inspiration. Thank you for sharing this with us Eclectics this week. Absolutely BEAUTIFUL and creative! I love it! Thanks for joining us for the Simon Says Stamp Challenge! 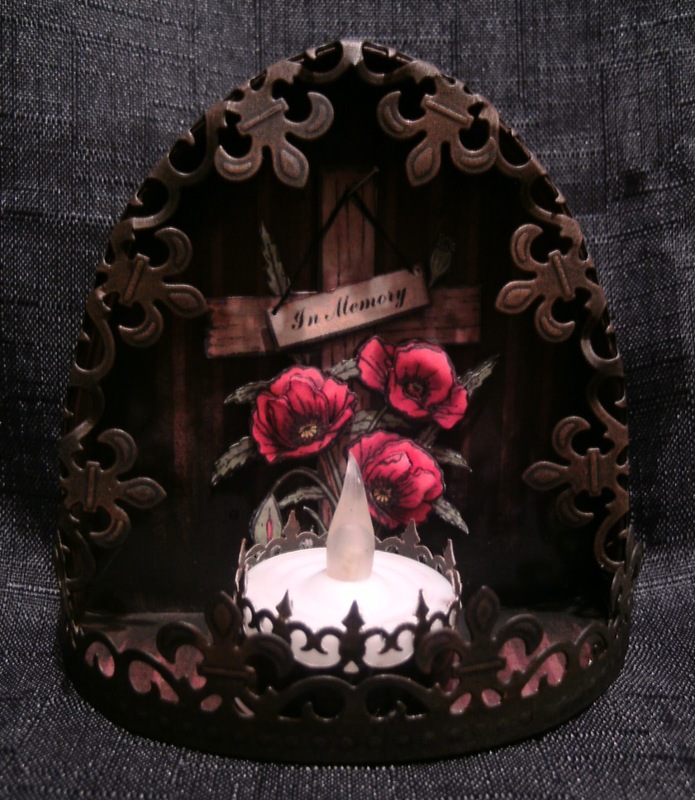 Beautiful poppies and Cross,love the shrine you created and your die cuts are awesome. Fabulous way to remember those that have left us and those that gave their all! Thanks for joining us at LEJ Designs! A stunning creation Thank you so much for joining us at The Crafty Sentiments Designs Challenge “POPPIES” . Your creation is fabulous well done and good luck Hugs Elaine . A beautiful creation, a wonderful design - so full of thought and feeling. Brilliantly colours, executed and a perfect sentiment. OMGoodness! So much attention to details, and it clearly shows that you have a loving and very appreciative heart.Such a beautiful tribute, thank you for sharing that with us over at Eclectic Ellapu! Your project is simply stunning! I love how it lights up so nicely too! Thank you for joining us this week at the Crafty Sentiments Designs Challenge, I hope you join us again soon! Breathtaking! 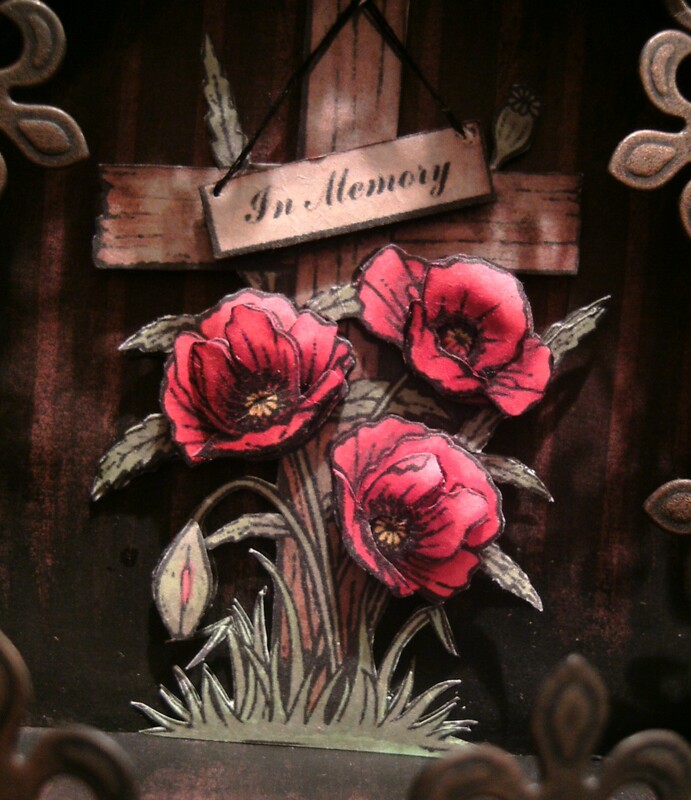 Thanks for sharing with us in our Remembrance challenge at the Card Crafter's Circle! Such a unique idea! Love the poppies! Thanks for sharing with us at Card Crafter's Circle! This makes me tear up for you..so beautiful BD..get well soon. This is an amazing creation. Thanks for playing with us at Sparkles and Glitter. I am in awe of you and your creativity. I know that you probably get tired of me saying that, but I cannot not say it. You are an inspiration. Thanks for joining us at Sparkle & Glitter.